mulching other garden beds until we get decent rain. 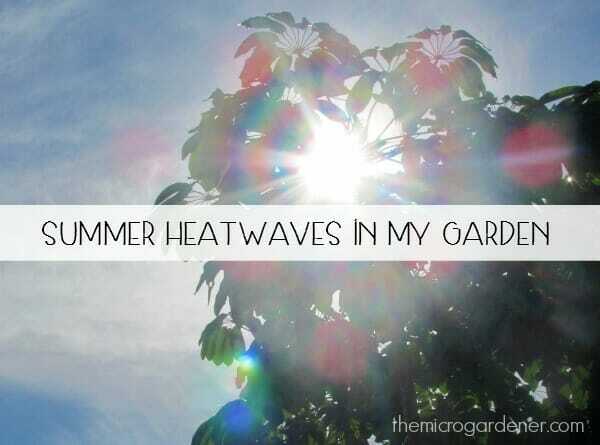 In hot weather, it makes sense to garden early morning and late afternoon. I take a morning walk around the garden as soon as I get up and later when it’s cool before sunset. I check out my plants and see who needs my help the most! 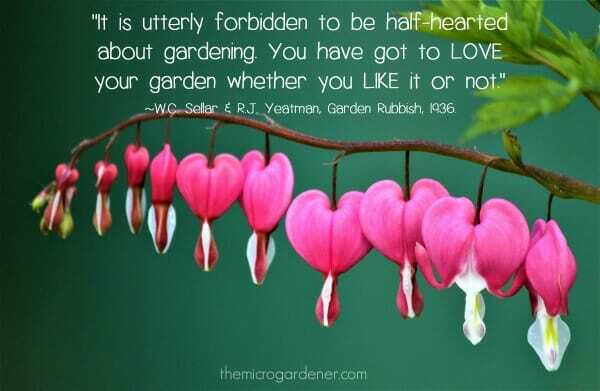 I always put a lot of love into building healthy soil. I build in ‘insurance policies’ so when drought, heat or pest insects arrive in the garden, the majority of plants can shrug it all off. I’m looking forward to sharing some of my strategies with you in my eCourses very soon. Check out my latest video as a taste of what’s coming. I focus on my VIPs (Very Important Plants) like fruit trees and fruiting crops. I make sure these special plants and trees get what they need. 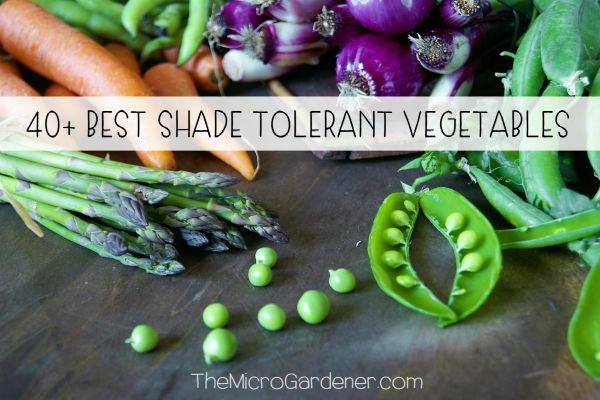 Enough moisture, mulch, shade protection and liquid tonics. Liquid seaweed and fish emulsion are quick fixes for most drought or water-stressed plants. 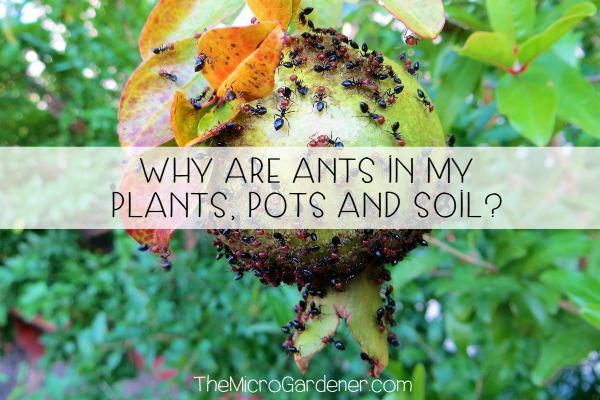 If plants can’t take up sufficient moisture, they can’t access nutrients in the soil either. So they suffer a double whammy. They are not only thirsty, but hungry as well! 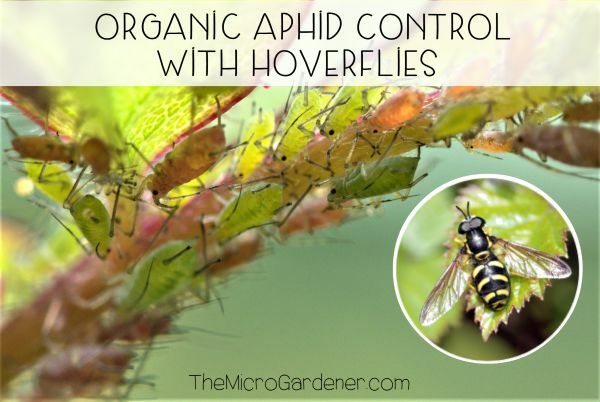 Stressed plants are pest and disease magnets. What can you do? I make up a diluted liquid seaweed/fish/mineral pick-me-up ‘tonic’ in a spray bottle and apply to the leaves early morning. The plants can take these nutrients up faster by leaves than the soil, but I also water in as well. Always apply mulch. The other VIPs in my garden are the wildlife – especially the pollinators and birds. 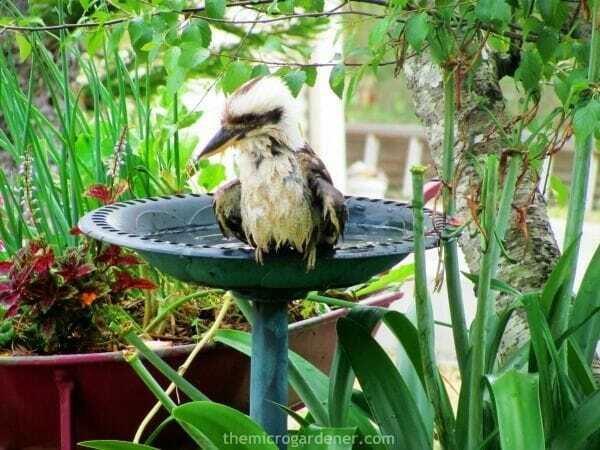 I fill my bird baths daily so these hard working pest managers can feast on grasshoppers, caterpillars and other pest insects in the garden. It’s a mutually beneficial arrangement! It also frees me up to focus on the important tasks rather than pest management. Sometimes I leave a few bugs in the bird bath so the next bathing bird enjoys a free protein snack and hangs around longer. harvest what the garden can dish up, despite the harsh conditions. There’ll be some plant casualties. Those poor souls who just didn’t get the moisture they needed and ended up ‘dried arrangements.’ Some will be scorched by sunburn or miss out on nutrients in the soil. Other plants will bolt to seed – at least you get some freebies. This is the school of hard knocks! The strongest survive and they’re the kind of characters you want more of in your garden. If you’re trying to grow food in hot or dry conditions too, make a journal note of all the plants that ARE surviving or thriving. 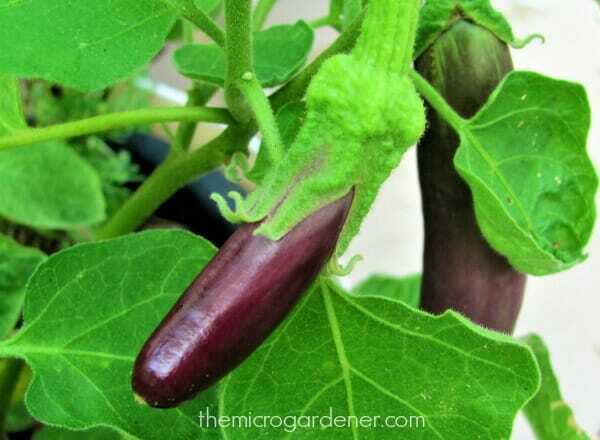 Make sure you take cuttings and save seeds from these tough guys so you have drought-resilient plants next season. Grow more of what grows well. What about you? 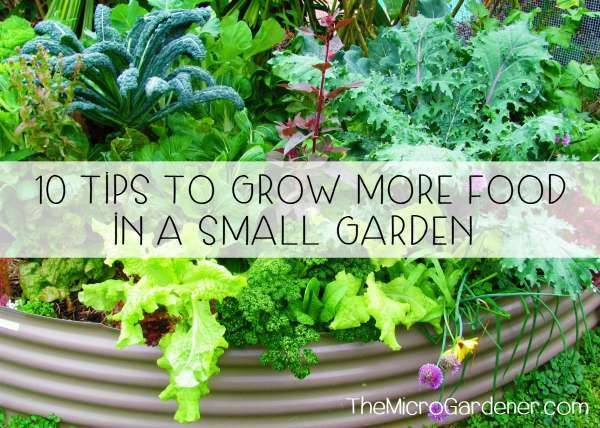 How’s your garden growing? If you’re suffering from hot or dry conditions, maybe take a break. No garden is perfect and certainly no climate. If you need some help with growing in difficult conditions, consider a garden consultation for personalised advice. Please leave a comment and I’ll dish up some more tips very soon. 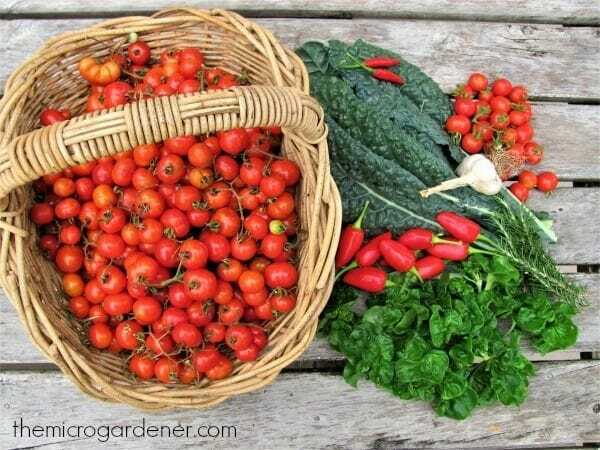 In the meantime, you may also enjoy 9 Strategies to Help Combat Common Edible Garden Problems. If you like this article, please share the love! In our summers (Lahore, Pakistan) temperatures can get to 45+ all over to 49 and sometimes 52 Celcius and winters often go all the way down sometimes to 0 but min most 2-3; not to talk about the rainy season when its cats and dogs and super humidity untolerable by our caucasian friends if they ever plan to visit. Sometimes I myself wonder how we could grow all we grow in this intense heat and extreme weather. I am planning to grow cosmos and tuberoses this season don’t have much time so will be trying to have the garden as much maintenance free as possible. But unlike you I get all my garden sprayed with fungicides every month. I don’t know how can you just manage all the pest with the wildlife when I too have plenty of wildlife (sparrows and mynas and crows who get lovely meal of boiled egg yolks every morning), so its a sad story of pest control here…. I tried to build a herbs and salad garden this winter (because we have some good day temperatures and plenty of sunlight in Jan-Feb) in pots and it was nonetheless an extremely pleasant experience. This year I may be trying some Iranian Saffron too. I think you should try Saffron if your weather allows it. Quiet maintenance free in a pot or 2. Great site very well presented. Just wanted to ask you if you had any advice regarding planting in very wet and cold conditions. 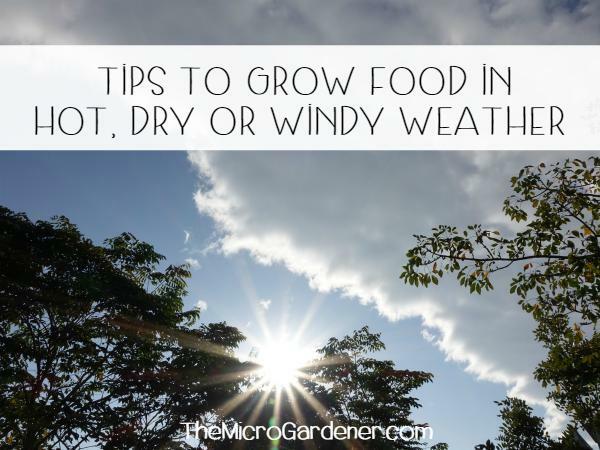 We have had a bit of a bad time with the weather here in England and although I had a very good season last year I am not sure when to plant out my seedlings that are growing well in my greenhouse. Should I take my soil’s temperature and go from there, or maybe under cover. Thanks for any advice. Very wet and cold conditions are not ideal for sowing seeds outdoors although some vegetables can handle it. Soil temperatures of course affect seed germination so raising seeds in your greenhouse is perfect to get a head start ready for planting. I suggest you check out the guide on what to plant when at Gardenate.com – it may help give you more specific advice on particular plants. I assume you normally plant out in early spring if your current weather conditions are still cold. If growing outdoors, you can make or buy a simple box frame with a piece of glass over the top to hold the heat and reflect sunlight to the plants when temps are colder. I also suggest you mulch well. This helps regulate soil temps and hold the moisture in the soil. This article lists soil temperatures for common vegies which may be useful for you. My other suggestion is to try timing your planting with the moon phases so your plants get the very best start in the season. You can read more about working with moon cycles in this article. Happy to answer any questions you may have. I work with nature however I can to swing things in my favour and this is one easy tool anyone can use anywhere in the world. It’s often overlooked yet makes a huge difference to growing healthy plants and harvests. Hope this helps you get started. If you don’t already, I invite you to subscribe to my free newsletter. I send out regular tips all year.